What won't it protect against? 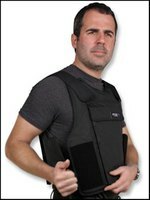 No vest will protect against every bullet, and a IIIA vest won't protect against heavy rifle fire without added armor plates. 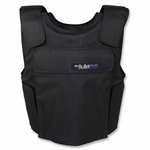 That is why our vest has front and rear plate pockets and why we sell ballistic plates as well. 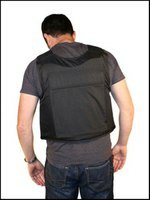 These bullet proof vests are available in five sizes: S, M, L, XL, and XXL. The BulletSafe Bulletproof Vest Size Chart Here is the BulletSafe size chart. Please note that we do not use a chest measurement for our size chart because most men do not accurately know their chest measurement. Our experience is that many different sized men will claim to have a 40 inch chest. Most men do know their height and their weight, so we use those measurements to size our vests. Fortunately, our vests run true-to-size, so if you know what size undershirt fits snugly around your chest, you can order your vest in that size. 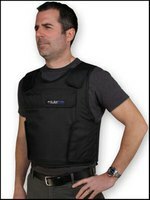 Another note on bulletproof vest sizing: Your bulletproof vest needs to fit in two main areas: your chest and across your navel. The length of the vest is not important as you can use the shoulder straps to adjust it, only be concerned with diameter of your midsection and chest. If you are a thin man with a large belly try to order at the top of your size range so that you can fasten the vest around your mid-section. If you are a competitive cyclist with large legs and a slender waist, order at the bottom of your size range. If you know the size of an undershirt that fits snugly across your chest, order that same size vest. JF said - "I am an extra large man and I needed an extra large bulletproof vest. I thought I might have needed a 2X because I usually wear a 2X t-shirt, but I see that the vest is best worn tight like an undershirt, so XL it is." Note: JF was 6'1" and 225lbs and a bouncer-type of build. TN said - "I wear a Large t-shirt normally but a medium undershirt so that it doesn't bunch up under a dress shirt. Usually though a medium undershirt is a little too short. Since the length of the vest is adjustable I went with a Medium vest. The large vest left too much of the velcro flaps hanging loose in the front." Note: TN is 5'11" tall and 175 lbs. He has wide shoulders but a slim midsection, your shoulders stick out of the vest while your midsection is wrapped, so a Medium was best. KJ said - "I'm a smaller guy that rides bikes a lot. I knew a small would be right and it is." Note: KJ is 5'4" tall and 140 lbs, he has a slender mid-section. MK said - "I'm a 2X all the way, I've been 2X since high school. I'm 6'5" tall and 280 lbs. I'm surprised that I could probably gain 20 lbs and this would still fit me." Note: This guy is super tall and although he is heavy, he didn't have a large midsection so a vest fits him well. VS said - "I'm 340 lbs and 6' tall, I can't wear a 2X or even a 3X t-shirt so I didn't think a 2X would fit me and it didn't. I went with the 4X and it fit well too. It's been a while since I was on the small end of a size, but this fits me well. I could gain 100 lbs and still wear these straps though. CH said - "I'm 6' tall and 190 lbs. According to the size chart any of three sizes would have been right for my height, but I fall right in the middle of the Large size for weight and that's what fit me when I visited the office. I was surprised because I wear an XL shirt. I never buy a Large at all because I like to wear my shirts loose. They joked at the BulletSafe office that maybe I should be buying smaller shirts and when I mentioned it to my wife, she said that I do wear my shirts too big." Note: CH fit right into a large. He probably would have been happy with a Medium or an Extra Large because the velcro closures allow our bulletproof vests to fit lots of people, but a Large was the right size.